Our local strategic plan envisions us building, creating or catalyzing thousands of housing interventions over the next decade to meet the local need. We will join affiliates across the country with a local launch event on June 12th and a course of action to follow up. a. Background: In the wake of a study showing a deficit of 4,000 units of affordable housing in the City, the Charlottesville City Council has been considering funding plans and individual proposals. During their budget deliberations, they seemed poised to allocate or forecast about $32m for affordable housing over the next five years. Thanks to advocacy from multiple parties and community members, Council has also signaled a willingness to allocate $800K this year toward the flexible and strategic Charlottesville Affordable Housing Fund (CAHF) with another $700K likely to be directed to the CAHF in December if and when the City has a year-end surplus. b. Habitat’s Position: We very much appreciate the City allocating and/or forecasting $32M for housing initiatives in the five year CIP and support those initiatives. We also appreciate Council’s growing recognition that funding should be tied to a strategic plan and should include opportunities at every rung of the housing ladder. Short of that, housing becomes a dead end. In particular, affordable homeownership is a key component of a healthy housing ecosystem. The rate of homeownership in the City is about ½ of the national average and African American wealth is 10% of the average, largely due to the fact that there are historic lows in black homeownership rates. We must proactively address this historic inequity. c. Action Needed: Please contact City Council at Council@charlottesville.org, and interim City Manager Mike Murphy at murphym@charlottesville.org and thank them for pledging to fund the CAHF at $1.5M for the upcoming fiscal year. The CAHF supports a wide range of housing alternatives, including critical opportunities for affordable homeownership for those who have been left behind. a. Background: The Regional Housing Partnership is in the final stages of review of the data from a regional housing gaps analysis. The intention is to release the study on April 19th in conjunction with a day-long forum on affordable housing. The goal of the RHP is to facilitate cooperation among all of the municipalities to create a holistic housing strategy to fill what appears to be a roughly 12,000 unit/intervention gap. b. Habitat’s Position: We support the RHP and are eager to play a role in developing a comprehensive strategy as well as doing our part to meet the need. c. Action Needed: Please contact your elected official and thank them for participating in the Regional Housing Partnership. We believe that, working cooperatively and strategically, we can align policy, funding and programming to align supply with demand. At the same time, on Wednesday, April 3rd, the Albemarle County Board of Supervisors will get a briefing on the initial data along with county staff’s prioritized list of strategies. We believe that jumping directly to a strategy without public participation, without input from partners and without focus on a regional approach is premature. Thank them for participating in the Regional Housing Partnership. Ask them to withhold action on a County housing strategy until there has been public participation, significant outreach to partners who provide housing and more work done by the Regional Housing Partnership to outline a basic, cooperative approach. a. Background: Each year, HUD requires localities to update their HOME/CDBG Action Plan. This plan informs how Federal funding will be allocated at the local level. The draft plan is available at http://tjpdc.org/media/Action-Plan-19-20-DRAFT-for-Public-Comment-03-25-19.pdf. This year, the local draft plan has no money available for downpayment assistance to help low-wealth community members purchase homes. b. Habitat’s Position: Given the dearth of local homeownership opportunities in the area, especially for low-wealth neighbors of color, a component of the Consolidated Plan should be at least $100,000 of funding for downpayment assistance. c. Action Needed: Please write to creasym@charlottesville.org and bcampbell@tjpdc.org and request that at least $100,000 of downpayment assistance, especially for families earning below 50% of area median income, be included in the Consolidated Plan Action Plan and in CDBG allocations. May 6th, 6:30pm in City Council Chambers. a. Background: The City of Charlottesville has been undertaking a process to update its outdated Standards and Design Manual. The SADM sets the regulations that guide the shape of development of our streets, sidewalks, lots, utilities, etc. and is a critical component in enabling or, conversely, discouraging creative urban design. 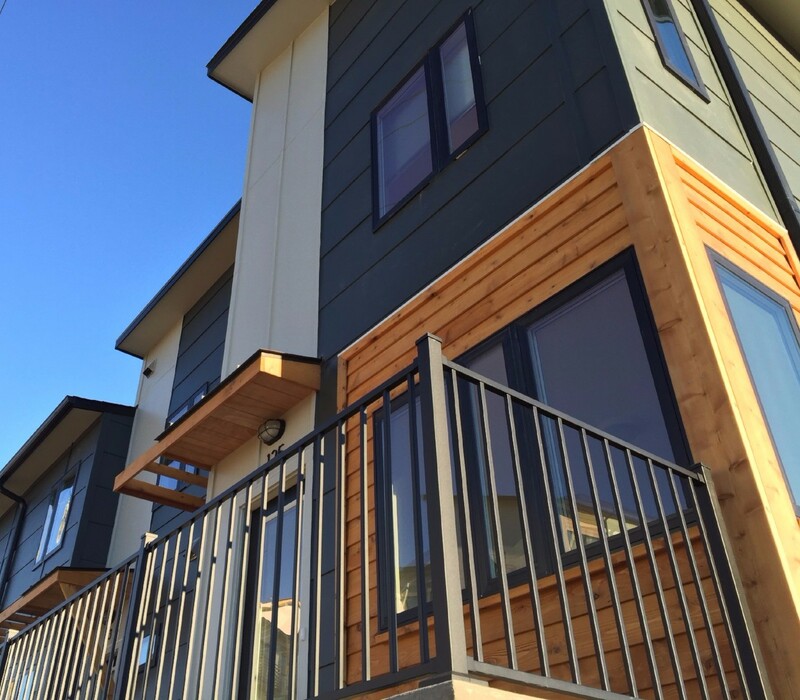 Last fall, City Council declined to vote to adopt City staff’s recommended update, stating that there was a significant disconnect between the community’s vision of safe, walkable streets and affordable housing and the dimensional requirements in the draft manual. They sent it back for further outreach and work. Within the last week, the City has advertised for a consultant to pick up the work of updating the manual. However, the Charlottesville Area Development Roundtable and the Bike and Pedestrian Advocacy Committee have each already proposed and comprehensive revisions. The SADM adds unnecessary expense to the cost of construction, which disadvantages affordable housing. See proposed revisions to Sections 4.3.3.3 (pavement sections), 9.4.1 (materials), and Table 4-2 (street elements). The SADM discourages efficient use of tight urban lots. See proposed revisions to Sections 9.6.3 (general requirements, private utilities), 9.8 (utility easements) and Table 9-4 (utility easements), 4.3.2.1.6 (ROW width), 4.3.2.1.8 (clear zones), 4.4 (alleys), and 9.2.2 (depth of utility cover). c. Action Needed: Please contact members of City Council and the Planning Commission at Council@charlottesville.org and PlanningCommission@charlottesville.org. Remind them that the City already has a strong alternative to the draft SADM manual that they rejected in the Fall. Ask both bodies to utilize the Charlottesville Area Developers Roundtable (CADRe) proposal as a starting point for final revisions. By doing so, our community will have the blueprint for a more appropriate set of regulations for attractive, affordable housing and communities. a. Background: Habitat is in the middle of an unprecedented, resident-led redevelopment process at the Southwood Mobile Home Park. Since 2007, we’ve been working with residents to bolster community capacity to be equal partners at the table. In January, Habitat and the residents submitted an updated rezoning application for Phase I of the project. Staff is still working with Habitat on resolving comments on the application. As such, the Planning Commission public hearing has not yet been scheduled. b. Habitat’s Position: Habitat has been awed by the great work of the residents to define their own future. We are also grateful to the County for being partners in our work. c. Action Needed: Please contact the Albemarle Board of Supervisors and Planning Commissions at bos@albemarle.org and PlanningCommission@albemarle.org. Thank them for providing the resources to allow Habitat to work side by side with Southwood residents to plan their own future. This one-of-a-kind project will be a national model for how to do redevelopment equitably and sustainably. Ask them to expedite review of the current application and vote yes to the Southwood rezoning application. Given time pressing deadlines for Opportunity Zone investment and Low Income Tax Credit applications, time is now of the essence for this to move forward. Also, please be prepared to show up at the PC/BOS meetings to stand up and show your support for the rezoning. Please email Garrett Trent at gtrent@cvillehabitat.org if you would like information about the date and time of the hearings once they are scheduled. This page will be updated on a monthly basis with new action items for people looking to advocate for affordable housing solutions in the greater Charlottesville area.